THE OLDEST LIGHT IN THE UNIVERSE, called the cosmic microwave background, is a fossil from the Big Bang that fills every square inch of the sky. It provides a glimpse of what the universe looked like almost 14 billion years ago, and can shed light on everything from the evolution of the universe to how much dark matter and dark energy the universe contains. Recently, two high-profile experiments released new data and analysis of this early light. These data seem to support the theory of cosmic inflation, which posits that the universe underwent an enormous expansion in the moments following the Big Bang. During this time, space grew monumentally, swelling from smaller than a proton to an enormity that defies comprehension. 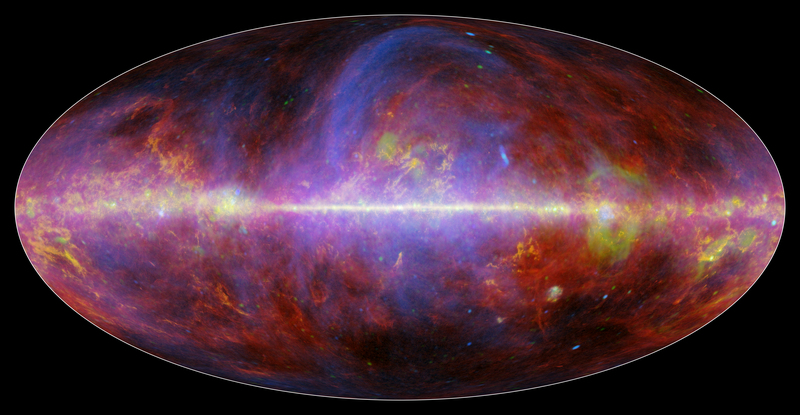 Last month, Planck released new maps of the cosmic microwave background supporting the theory of cosmic inflation. The Kavli Foundation spoke with Dr. George Efstathiou, director of the Kavli Institute for Cosmology at the University of Cambridge and one of the leaders of the Planck mission, to better understand Planck’s latest results and their implications for the theory of inflation. On February 18, 2015, three preeminent scientists came together to discuss the latest results, what they mean for the theory of inflation, and what we can expect to learn about the very early universe in the coming decade. Below is a modified transcript of their discussion. Edits and changes have been made by the participants to clarify spoken comments recorded during the live webcast. To view and listen to the discussion with unmodified remarks, you can watch the original video. George Efstathiou – is a cosmologist with a leading role in the Planck mission, which studies the oldest light in the universe. He is the Director of the Kavli Institute for Cosmology at the University of Cambridge and Professor of Astrophysics at the University of Cambridge. Clement Pryke – is an experimental cosmologist and Associate Professor at the University of Minnesota. He has played a leading role in the construction and operation of a series of telescopes that study the universe's first light from the South Pole, and in analyzing the data they produce. Paul Steinhardt – is the Albert Einstein Professor in Science and Director of the Princeton Center for Theoretical Science at Princeton University. His research spans particle physics, astrophysics, condensed matter physics and cosmology, and he shared the 2002 P.A.M. Dirac Medal for his role as one of the architects of inflationary theory. Watch the Hangout with George Efstathiou, Clement Pryke and Paul Steinhardt. THE KAVLI FOUNDATION: Clem, you work on an experiment that looks for evidence of inflation in the cosmic microwave background. I’m hoping you can start us off by describing what such evidence would look like. CLEMENT PRYKE: We’ve been studying the cosmic microwave background for some time now, and some people would hold that there already is extensive evidence for inflation from observations. You can consider the cosmic microwave background a blobby glow. Within it, there are blobs preferentially of a certain size, about a degree across, about twice the size of the full moon. There’s a lot of those blobs and that is a signature that the net global curvature of the universe is essentially zero. That holds some evidence for inflation. There are other observations in the statistical properties of the microwave background pattern that also point to inflation. The stuff that we’re talking about today specifically is looking for evidence of the so-called gravitational wave B-modes. This is a kind of swirliness in the polarization pattern of the microwave background. TKF: Last year an experiment called BICEP2, which you work on Clem, announced evidence of gravitational waves – ripples in the fabric of space that would be evidence of inflation. Since then, and after new analysis, the conclusions have been reframed. Can you explain not only where we’re at now, but also more broadly in what ways this might change how future experiments are designed. PRYKE: About a year ago, we announced that we had detected this so called swirliness, this B-mode in the microwave background polarization pattern. Now, a potential source of such swirliness is gravitational waves. These are ripples in the fabric of space-time that originated at the very, very first instant of the universe, an unimaginably small fraction of a second after the beginning. Inflation, if it occurred, perhaps injected these ripples into the fabric of space-time. What we can potentially see is the signature that they imprint into the pattern of the microwave background at about 400,000 years after the beginning. That’s what we were looking for. Now, we found such a swirly pattern and we announced that and it generated a huge amount of excitement. But it turns out that emissions from galactic dust can also produce potentially such a swirly pattern. The new analysis that’s just come out in conjunction with Planck seems to indicate that a substantial fraction – and perhaps all – of the signal that we’ve detected is in fact from galactic dust and not from these exotic gravitational waves from the beginning of the universe. TKF: Will future experiments be designed differently as a result? PRYKE: The basic experimental technique remains the same, but it becomes necessary to make observations at more than one frequency. Up until now, BICEP2 and the Keck Array, its sister experiment, have been concentrating all their sensitivity at a frequency of 150 gigahertz, 150 billion cycles per second. That’s a good frequency to hit if you’re looking for the microwave background. If you want to disentangle the dust component, you also want to have observations at other frequencies – potentially higher frequencies where the dust is stronger so you can get a better measurement of it and then remove it from the lower frequency measurements. That’s where everybody always knew that it needed to go, but now it looks like we need to go there perhaps a little sooner than we anticipated. Frequency diversity is the future. TKF: George, your experiment, Planck, released results earlier this month. What do these results tell us about inflation? GEORGE EFSTATHIOU: Planck is a very different experiment. The main science goal for Planck was to basically exhaust what we could learn from the temperature fluctuations in the cosmic microwave background. That’s why we proposed to launch a space satellite with quite high angular resolution – the angular resolution of Planck is about 5 arc-minutes – to map the whole sky from space. The advantage of operating from space is that you’ve got a quiet environment. You can survey the whole sky. We designed the satellite purposely to have a very wide frequency coverage. It has frequency coverage from 30 gigahertz right up to 850 gigahertz. At these very high frequencies, you’re not seeing primordial fluctuations from the early universe. Those high frequencies are monitoring dust. From space, you can access these very high frequencies. In addition to the temperature measurements, Planck measures polarization; the fluctuations from the early universe are expected to be polarized at the few percent level. We have polarization sensitivity from 30 gigahertz up to 353 gigahertz. When we monitor polarization at 353 gigahertz, we’re primarily measuring polarization from dust in our own galaxy. That’s why it was so useful to be able to combine our high frequency measurements with the BICEP measurements to monitor the level of dust contamination in the BICEP field. So those are the goals of Planck. As you say, we published the second set of cosmology results just two weeks ago. The sort of things that we can do with those measurements can say very precisely what the fluctuations are like, what the statistical properties of the fluctuations are like, and what type of fluctuations they are. That’s where the connection with inflation comes in. Simple models of inflation predict a particular pattern of fluctuations and that’s what we see to high precision. There are other possible sources of these fluctuations – for example from cosmic strings – or a different type of fluctuation that comes from variations in the equation of state of the universe. We see no evidence for those types of fluctuations, to quite high accuracy. TKF: Paul, what’s your take on what we know so far about cosmic inflation? If you, Clem and George were in a pub, what would you be agreeing on and what would you be arguing about? PAUL STEINHARDT: Let me first of all say that the Planck experiment is a magnificent project that has delivered information about the early universe with incredibly high precision concerning both the temperature variations and now the polarization effects due to dust. Planck will have a permanent place in the history of our understanding of the universe. Quite aside from any theories – maybe our ideas about the universe will change radically – what Planck has measured has permanence and will be a part of the story that we have to explain in all future theories. What first strikes me about the Planck results and the data obtained by other experiments that preceded it is that it’s presenting a picture of an extremely simple universe. There are all kinds of complexities that we could have seen in the universe that we don’t see, complexities that reasonable ideas suggest could be there, but we don’t see. The universe didn’t have to be as uniform as it appears to be. The deviations from uniformity are about as simple as quantum mechanics allows, nearly scale-invariant fluctuations. We could have seen what we call non-gaussianities, deviations from simple bell curve behavior of the fluctuations. We don’t see those. We could have seen effects, as George mentioned, of cosmic strings or cosmic defects and other physical effects that would have disturbed the microwave background in complex ways, but we don’t see those either. We could have seen gravitational waves and we don’t see those so far either. The permanent result we have at the moment is that as far as we can tell, the aspects of the universe – the characteristics needed to describe the universe on the largest scales – have come down to a very, very simple few. I think that’s important because as we talk about theories, I think a simple universe demands a simple theory to explain it. If we find that our theories have to become more complicated as we go along, if we find that we have to add more bells and whistles, more parameters, more conditions, we should be disturbed. That will be, I think, an important part of the discussion we’re about to have. In particular, the universe that we found is simpler than the one we expected from inflation. That’s because in inflation, the universe becomes smooth when the energy density is very high. It’s the quantum fluctuations of the universe during the period in which there is a high concentration of energy that are supposed to explain the temperature variations, but that same effect also produces warps and wiggles in space-time itself. These warps and wiggles become the gravitational waves. So it’s the very same physics that produces the temperature variations that we do see that is supposed to produce the gravitational wave effects. So we should expect to see those as well. BICEP2 suggested in March that we might have, just as expected from inflation, but we now know that that’s not the case. That’s an important discovery. It means that you either now have to add bells and whistles to your inflationary model or begin to think about models that would naturally explain everything else that we have talked about, but not produce strong gravitational waves. PRYKE: I would say that we were very surprised last year when we thought we had found a very high level of gravitational waves. Many theorists will say that the expected level is lower. In other words, sensible inflationary theories that are based on physics predict levels considerably lower than what we thought we found last year. I’m just an experimentalist. I don’t really have strong opinions either way. But the level that we were reporting last year was very surprising to many people. STEINHARDT: I think the reason why it was surprising to many people was because the Planck data from 2013 had already put limits on how strong the gravitational wave signal could be that were more stringent than the ones that BICEP claimed to have found. Theorists had already begun to adjust their inflationary theories to the Planck 2013 data and then suddenly they had to whip around and encounter the fact that the gravitational wave signal may be much bigger. If you go back to the textbook models of inflation, they all give values for “r” [a variable that describes the strength of gravitational waves] that are on the scale of 0.2 and higher. As the limits had been decreasing, they had been squeezing out those simplest models. BICEP2 momentarily eased the restrictions, but not they are back. Now to accommodate the data, we have to add more parameters, we have to fine-tune those parameters to a much greater degree than before, and we now need much more special initial conditions before. For most of the theories that people are talking about no, one also has to be concerned about the fact that they are now much more exquisitely sensitive to quantum corrections than the kinds of models we were talking about before. A whole set of new problems has been introduced for inflation, besides other ones that we may yet talk about, the big problems of inflation. A whole set of new problems have been posed by the data and I think that’s very interesting. The fact that we have data that’s so precise that it can impose these kind of constraints on our fanciful theories is fascinating and wonderful. EFSTATHIOU: From the point of view of theory, I don’t think that my position is actually very far away from Paul’s. But in this sort of discussion, it depends whether you think the glass is half empty or half full. With the experiments that we’ve done, with Planck, BICEP and a whole host of previous experiments, we’ve been testing the universe as it was 10-35 seconds after its creation – an unbelievably early time. And we now have very precise measurements that tell us something about what the universe was like at those times. So we shouldn’t lose sight of the fact that it’s an amazing thing to be able to do that. We can’t predict earthquakes, but we can say something about the universe basically at the instant of creation. For quite a number of years, I’ve been giving a public talk called “The Measure of the Universe, A Crisis for Cosmology” because inflation, some aspects of what we think we might know about string theory, the existence of large numbers of metastable vacuum and even the existence of dark energy – all these things lead to an infinite number of infinite universes. That is a crisis. It’s no surprise that there are really, really important open issues about the beginnings of the universe, the conditions that could have perhaps generated inflation, and the future fate of our universe. All of these questions are open. But the fact that we have all of these unanswered questions shouldn’t detract from the fact that we have learned something about the universe at these very eary time. STEINHARDT: I think we agree on that point. I’ve tried to emphasize that I think the data is telling us something about the universe at its very early stages that is now part of our permanent understanding. Now, the question is how we explain it. The inflationary explanation that has been standardly given has, for various reasons – including the ones that George has now raised – failed. We can’t make a consistent theory of inflation that predicts any of the properties that George mentioned. It’s true that when inflation was first invented, before we understood it properly, we thought that it did predict, for example, a flat and smooth universe. But what we’ve discovered is that we misunderstood the role that quantum physics plays in the story. It turns out that rare quantum fluctuations that we ignored at first keep inflation going in places far beyond where we can see. They keep creating new patches of the universe that stop inflation and may or may not have stars and galaxies in them. In fact, they produce patches of the universe which explore all conceivable physical outcomes for the universe that are physically possible. For example, we want to say inflation predicts the universe is flat, but that turns out to be only true for a subset of the patches of the universe. There’s an infinite number of patches in which the universe is open, an infinite number of patches in which it’s closed. We want to celebrate the fluctuations as evidence for inflation, but that’s only true for a subset of these patches. There’s an infinite number of patches for which that’s not the case. If we observed a closed or open universe, it would fit the picture just as well. The same is true for the smoothness. Both smooth and warped patches are produced. This is what George was referring to when he mentioned the measure crisis. We live in a single patch in this multiverse of possibilities. We have been trying to answer the question: What is the probability of having the properties that we observe rather than the properties found in other patches? At present, we can give one of two answers, either completely indeterminate or infinitesimally small given that there are an infinite number of other possibilities. The remarkable situation is that we observe a simple universe, but the theory we’re using to explain it, inflation, produces an infinite multiplicity of alternatives – including universes that are very complex. To explain our one simple patch – our observable universe – we are invoking an inflationary theory that produces multiplicity and complexity of infinite degree. This is a major failure of a theory. It does not explain the most apparent feature of the universe: its simplicity. The theory needs to be fixed or to be replaced. EFSTATHIOU: I take that to just be inflation as we understand it. Now, it’s an incomplete theory. I don’t think that even the most diehard fans of inflation would argue that inflation isn’t an incomplete theory. STEINHARDT: That’s too weak a statement. I would ask you, what does inflation predict? Does it predict a flat universe or not? Because proponents point to the multiverse and before we knew it was flat, they were very happy to point out that there were patches in it that are not flat. They were prepared to explain any outcome. EFSTATHIOU: Absolutely. I agree that there’s a whole series of questions that depend on understanding the global structure of the multiverse, if the multiverse really exists. And we don’t have the mathematical language to describe it at the moment. The idea that the fluctuations arose from quantum fluctuations that were stretched in scale and became classical fluctuations in the curvature that then grew to make a structure, that is something that you can phrase in a way which doesn’t need a complete theory to do a calculation. You can do the calculation and then you can compare with the observations. That model fits perfectly. EFSTATHIOU: The origins of the fluctuations I think is the most important aspect of inflation. STEINHARDT: We know that it doesn’t have to come from stretching. We know that can come from contraction as well. EFSTATHIOU: It could come from contraction. PRYKE: Let’s bring things back to experiment for a moment. A year ago, we thought we detected this unexpectedly large amount of gravitational waves. From the recent joint analysis with Planck, it looks like, at most, gravitational waves could be about half that. We’ve only actually pushed things down by about a factor of 2. It’s now consistent with what Planck found from the temperature fluctuations. Now, we’re going to keep looking. That said, it is a good question how much the expectation was driven by experiment and how much was driven by theory. When we were announcing the BICPE2 results, some other prominent theorists told me that inflation theories that produce as much gravitational waves as we seemed to be seeing were ridiculous. They weren’t based in physics. So we’re going to keep pushing down and looking for a gravitational wave signature because it’s certainly something that is present in some theories so it’s something that we can probe. It’s something that we can do to try and get extra information about the universe. That’s our job as experimentalists. We think that we can go considerably lower. One has to bear in mind that an amount of gravitational waves as large as half of what we previously thought we had is still possible. We’re going to have a series of experiments going forward that push things down. We’re going to have new data in a few months from the last year of the Keck Array. We just installed BICEP3 and also retrofitted Keck Array with 220 gigahertz receivers. They will help to improve on the dust-constraining ability. Planck’s 350-gigahertz channel is really nice, but it’s not the final word. We need to do better on data. There are a whole bunch of other experiments that are also pushing this down. TKF:Clearly there’s quite a bit of controversy in this area. We’ve got experimentalists looking to detect whatever they can to improve our understanding and we’ve got theorists who feel inflation might be untestable. STEINHARDT: It is important to understand that I’m not the only one that feels it’s untestable. It is not a statement that originates with skeptics. If you consult the proponents of inflation, they will tell you – and they have said explicitly, publicly and in the press – that the theory is untestable. It’s not a question of the critics thinking it’s untestable. It’s a question of our current understanding of the theory. The proponents will tell you that inflation is so flexible that it’s untestable. PRYKE: Inflation has more than one critic. You’re certainly not the only one. But others will say that it’s already proven, that we didn’t need to go looking for gravitational waves because the spatial flatness and scale variance is already proof of inflation. I don’t claim myself to be qualified to have such opinions, but there are people that do. They make very strong statements. STEINHARDT: I think it’s generally agreed that inflation almost inevitably gives a multiverse and if it gives a multiverse, then you can’t say anything about its predictions. I think that most theorists who have looked at the issue and studied inflation agree with this. To talk about it making predictions just doesn’t make sense. You have to imagine that new elements gets added to inflationary cosmology that are so powerful that they take the multiverse of possibilities and reduce it to one and, further, that the new elements happen to pick out the kind of universe we observe. That would be a pretty powerful new set of ideas added to the current understanding. It may be possible, but it’s going to be an overwhelmingly powerful idea, more powerful than inflation, which was unable to do the job. EFSTATHIOU: That really is my point. It’s not surprising that we have problems with the initial conditions of the universe and the global structure of the universe. That certainly doesn’t mean that inflation is wrong. I think what it does mean is that the theory is seriously incomplete and a resolution of these problems is going to involve revolutionary new physics. That, I think, is a good argument linking back to what Clem says. When I talk to experimenters, my general advice is don’t pay attention to theoretical predictions. Don’t believe what theorists say. There is no consensus on many of these questions from theorists. To an extent, we have to be driven by observation. The great thing is that you can do experiments that really test these things. We haven’t exhausted the field. Planck was a very expensive experiment, but it was a tiny fraction of the cost of the Hubble Space Telescope and even a tinier fraction of the cost of the James Webb Space Telescope. Experiments like Clem’s experiments are much less expensive. If there’s no technological limit, if the costs are not outrageous, and if we can test the early universe – then I think we should. This revolution is going to be observationally driven. STEINHARDT: I want to make sure it’s clear that we all agree that we should be extracting as much out of the observations that we can, that we should be pushing the limits of our technology to get as much information about the universe as we can. In particular, I’m very interested to see if this simplicity that’s there now maintains itself. The moment we see the slightest deviation from this simplicity, that’s going to be a game changer in terms of our theories and our understanding of the early universe. For example, recall the period when it appeared that Planck had a limit on the strength of gravitational waves and BICEP2 had detected them to stronger than that level. If those two results were both true at the same time, that would have required a complex explanation. It would have been a real game changer. It would have thrown out all our current ideas about the universe in one shot. That conflict has gone away, but we must keep looking because we have the technology to push the current limits and our understanding further. Every bit of information, even seeing just continued simplicity, is revealing. It limits the possibilities. In particular, an example of an alternative approach to inflation is to have a universe which is contracting, bouncing and then expanding. That particular picture tells us that we shouldn’t see gravitational waves at the levels that we would be able to measure in the near future. It would have to occur at a much lower level. So, if cosmic gravitational waves really were detected and turned out to be at half the level of the current limits, that would blow away an entire spectrum of alternative ideas. That’s the power of these measurements and why it’s important to continue to pursue them. TKF: It sounds like experimental results can be used to sharpen theories of inflation, but also I’m wondering if there is an experimental measurement that would absolutely prove the concept of inflation beyond a doubt. Is there something that we can go out and measure tomorrow and prove this idea? PRYKE: As far as I understand, gravitational waves are our last best hope for something that generically exists in inflationary theories, but tends not to in alternative theories. Paul may disagree, but I think it’s still probably the best game in town. EFSTATHIOU: One could produce gravitational waves from defects and these could produce an extra source at low levels. I think that Paul is right that a failure to detect gravitational waves would not rule out inflation. Apart from the measurements that we’ve already made, I’m not sure how you would really prove beyond a doubt that inflation happened. PRYKE: I think the question was whether we could rule it in. To rule it out is not possible. STEINHARDT: I don’t think I would rule it in either. The detection of gravitational waves may not be unique to inflation. The fact is that theorists have not really explored a wide range of ideas. Very few for the last three decades have explored any alternative to inflation to see what the consequences are. I don’t think there’s any reason to believe there cannot be alternatives that produce gravitational waves in addition to flatness and smoothness. That’s why it’s so important to determine whether any waves are there or not, since that will help sort out the possibilities. The problem with inflation is that right now, based on our scientific understanding of it, you can’t rule it out or in because it allows for every possibility. This means that it lies beyond the reach of normal science. We cannot allow theories that allow any outcome. Among other reasons, you would soon find that there are many ideas you could think of that allow an infinitude of possibilities. Observations and experiments would not be able to distinguish among them. This is what I mean when I say such theories are beyond the realm of normal science. Whatever you observe, Clem, you can find it in the multiverse. What does it prove if you find it or if you don’t find it? The answer is you shouldn’t be considering such a theory in the first place because it’s not testable and it’s not falsifiable. PRYKE: I partially agree. We shouldn’t call inflation a theory. We should call it an idea. It seems to me that it’s more in that category. As much as I hate anthropic arguments, I wonder how many of these multiverses that had different parameters would actually support human life to ask the question of why the parameters were the way they were. STEINHARDT: We actually know the answer to that question. There’s exponentially more patches which are habitable and can support life that are different from us than are like us. As a simple example, consider bubble or patches that have the same properties as ours except they are younger, even just a second younger. They can certainly support life – we could exist in a universe that is a second younger. Yet we know from explicit calculations those patches are exponentially more numerous than ours and occupy exponentially more volume. We are very unlikely in the multiverse by any reasonable measure we currently know. That’s been the problem. People have worked hard for 30 years, since we discovered the term inflation, to see if there was any plausible measure by which we would be the most likely. No one has succeeded yet. So this is why George talked about the measure crisis, because not only have theorists failed, but every failure has shown that the problem is more difficult than we thought it was. PRYKE: Let me see if I follow you, Paul. You say that all of the current theories are untestable, but yet you support us continuing to make measurements. If any outcome that we got from our measurements was explainable in an infinite number of ways, why are we bothering to make measurements? STEINHARDT: First, I think we should be excluding from scientific consideration theories that produce an infinite number of outcomes with equal probability. If a theory is not subject to test, it’s beyond the realm of normal science. We should not be considering it as part of normal science because I can invent very quickly other theories which are equally untestable. For example, suppose I said the Big Bang happens many times. There’s no inflation. However, the Big Bang happens many times producing completely independent disconnect universes, and each time the starting point is a little bit different than the one before. According to this idea, we happen to live in one of those regions which just happens to have the properties we observe. That’s not really very different from the multiverse except it didn’t require inflation and it didn’t require any of other features that we have to invoke in order to make inflation work. We don’t need an inflation or an inflation potential. We don’t have to add any parameters like we now do thanks to the data that Planck has produced. We don’t have to do any of those things. Yet, I hope we agree that this is a bad idea. If I allow an infinite number of possibilities, that would be consistent with any outcome, like the multiverse, but it would be equally useless. It’s not that it’s right or it’s wrong, it’s just nonsense as a scientific theory. PRYKE: As a general point of philosophy, just because a theory is untestable doesn’t actually prevent it from being true. I think you’d agree with that? STEINHARDT: It could not be scientifically true. I think I actually would disagree with you on that. PRYKE: No, we said philosophically. We can’t rule out a theory of the universe just because it’s not testable, unfortunately. EFSTATHIOU: As I said, inflation as we understand it today is an incomplete theory and there are open issues that require really important new types of physics to understand them. An example, is in the physics of black holes where there’s a problem with reconciling quantum mechanics and gravity. That problem comes from the existence of an event horizon. We have a problem in understanding the theory from a local point of view and from a global point of view. I think that’s a very similar problem with the one that we have with understanding the multiverse. The black hole problem is not resolved, but that doesn’t mean that we don’t understand black hole evaporation for example. That part of the theory is okay. Inflation is like that. STEINHARDT: I don’t like analogies so I won’t pursue that one. I think our best understanding of inflation at the moment – as the theorists who developed the theory seem to agree on – is that inflation produces this multiverse and that in this multiverse everything is possible and there’s no measure at the present time that tells us which is more probable. That means the theory is unpredictive. Clem, I’m speaking as a scientist so if you want me to think about philosophies other than science, that would be a whole other discussion. But within the realm of science, I’m really not supposed to consider such theories because it will quickly lead to a nonsense discussion within the realm of science. PRYKE: I actually often make the argument you’re making: Untestable theories are not science and therefore are uninteresting to scientists. But I'm not sure – it seems an extreme position to tell someone what they may and may not consider. TKF: Do you think there is enough information in the cosmic microwave background for us to really ever determine what the universe was like at the very beginning? Is the end goal attainable? PRYKE: I think something that the viewers should take away is that there’s an enormous amount of information in the cosmic microwave background. We’ve already extracted a huge amount of information about the actual universe in which we live. These simple conditions, these statistical properties that have been mentioned, they don’t happen by accident. They are a vanishingly small subset of the possibilities. We have learned a huge amount about the universe. Whether it’s enough, or whether it will ever be enough, to absolutely pinpoint the exact theory is unclear. As George and Paul have emphasized, we need more theoretical developments and we also need further experiments. The situation is not settled. Whether it can be settled is, I guess, unclear. EFSTATHIOU: I think in addition to gravitational waves, it would be very, very valuable to get high-precision measurements of the polarization patterns in the microwave background at very large scales. This is where Planck and WMAP see some funny features. They’re not so statistically unlikely in simple models of inflation that an inflationary theorist would lose sleep, but they’re suggestive of new physics. I would like to see a high precision cosmic microwave background satellite that can measure these things to really high precision in polarization as well as in temperature and then see what we get. STEINHARDT: Let me give a broader perspective. I think progress on this might not come from the places where we’re currently looking. We should of course continue to get as much information out of the microwave background as we can because that’s a very powerful tool for learning about the conditions in the early universe that any theory has to match, but where the next breakthrough will come might be from someplace unexpected. For example, one of the alternatives that I’ve been considering is that of a cyclic universe in which the universe goes through regular bounces at intervals of maybe trillions of years or more. In this case, one of the predictions is that the current phase of accelerated expansion has to come to an end at some time in the future to produce a bounce. Maybe we can find independent evidence that our current vacuum is unstable and will decay and lead to a period of contraction. That’s not as unfeasible as you might initially guess. The recent measurements at the Large Hadron Collider in Geneva told us something about the contribution of the Higgs field to the vacuum state of the universe. Now, what it tells us depends on what other particles exist in the universe other than the ones we already know, including particles that may yet be discovered. But if we just assume that the particles that exist are the ones that we’ve managed to generate so far, it tells us that the vacuum state of the universe is metastable. It will eventually decay and lead to a period of contraction and that would be a situation that would be pretty difficult to make work with inflation, but is exactly what is called for in a cyclic picture. I just raise this as an example where sometimes it’s a completely different realm of experimental science that you have to pursue to find the next step forward, to separate the different ideas.